Is it easy to decide between an annually paid edition of Magento known as Enterprise and a free edition known as Community? It is really a tough decision to choose between the two because when people talk about Magento Community and Magento Enterprise; the first thing that pops in our mind is to take advantage of the free version over the paid version. The key motto of this comparison is not to pick up the least feature edition of Magento and customize it to suit your requirements, but to select the correct edition that satisfied the main goal of your online businesses. If you are planning for a startup online store, you can easily prefer to choose the Magento Community edition, which is a free version, but if you are planning to run your online shop on a rather extended scale, then it becomes important to know the exact set of features and benefits of both these editions to choose the one that fir your business. Magento has already withdrawn its Go edition for shifting its focus entirely towards the betterment of its Enterprise and Community Editions, which are used by more than 220,000 retailers and are still growing. But the main concern is to choose the most ideal edition among these two that meets your exact requirements and help you to develop your online store in the way you want and can fit the needs of your target audiences as well. To help you with right selection of Magento Edition, I am going to provide you with the important details of both Magento Community and Enterprise editions so that you can get convinced about your selection. Free is always good, right? But do you think that the decision of developing your online store on the basis of investment only will generate better results for you. It’s true to take care of your budget while undertaking an online business, but before opting for something free, it becomes necessary to know the main features offered by this version. The main question that is asked by ecommerce retailers who are trying to decide what to choose is: What do I really get if I choose free open source Magento Community over paid Magento Enterprise version? Magento Community was created as free open source version which means any one can easily download this version without paying anything from their pocket. With this feature, retailers or store owners can easily manage their inventory with backordered items, maximum and minimum quantities. You can easily export and import catalog using this feature. Retailers or store owners can also perform sorting of products according to their price, brand etc. There is no annual license fee required for using this edition. This edition can easily be used by both developers and merchants for adding new features and extensive due to its user-friendly interface and backend. You only have to pay for your web hosting, domain name, and a skilled Magento developer to create and maintain your ecommerce store. It offers code level accessibility to the store owners, which means if you want to change the system, you can easily do so. It comes with impressive Web Services API that allows you to integrate with other systems conveniently. Magento Community is blessed with more than 7500+ extensions that makes easier for the store owners to enhance their stores’ functionalities. This edition has mobile commerce theme that allows you to drive traffic to your online stores through the mobile platforms as well. Multiple store is another added benefit of using Magento Community that allows the store owners to have multiple stores with one common backend system for all. Magento Community has an impressive system that allows the store owners to create discounts on their online stores with free shipping and other lucrative. After discussing loads of advantages offered by free open source edition Magento Community, let’s discuss the key features of another popular paid edition Magento Enterprise. It will help in giving you a clear picture of which of these two editions will exactly meet with your set of requirements. 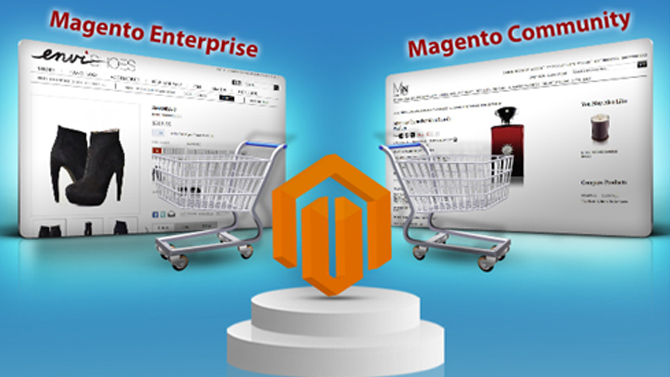 Magento Enterprise is considered as a scalable, high performance ecommerce solutions for larger and fast goring online businesses. With its enterprise class set of features, it helps you to create customized ecommerce solution. Developing your online store on Enterprise edition helps you in handling large catalogs of products. Full page caching is another interesting feature of Enterprise version that lacks in Community version. With this features, the store owners can easily create static HTML based snapshots for each page on their website. Full page caching also reduces the loading time of product pages. With this paid edition, you can easily roll back to the earlier version of your CMS page, category page or product page. Besides, you can also restore your yesterday’s database backup with this roll back feature. If you are looking for better flexibility and scalability for your online store, then Magento Enterprise is a good choice because it makes development of scalable online store much easier by separating the parts and pieces of your online store on to different servers expediently. This version is bequeathed with improved tax calculation systems that allow you to create and manage tax rules and rates with ease. It also offers a more streamlined and faster checkout flow than the free Magento Community version. You will get better logging and site access permission and improved administrator roles with this edition. Besides the benefits of Enterprise discussed above, the paid version also offers the online retailers a secured payment bridge, which is amenable with the PCI security standard council. After going through the features and advantages of both editions, it depends upon you to choose the one that fits your business and its goals. However, if you are a kind of person who likes to scrap things together to make them functioning, then the free Magento Community edition is an ideal option for you, but if you want an all-in-one package that is tuned with more advanced features, then Magento Enterprise will be a better fit. If you want to present some more advantages of these two versions, please share with us below. Manmeet singh is a SENIOR SOFTWARE ENGINEER with TIS India Business Consultants Pvt. Ltd. since the last 6 Years. He is a programming geek who spends most of his time developing web applications , enhancing user experiences and creating usable softwares. He has helped many overseas clients come out of the project management nightmares by comprehensive requirement analysis and ensuring timely delivery of projects.